Or, if you don’t speak binary, welcome to this week’s Math Munch! 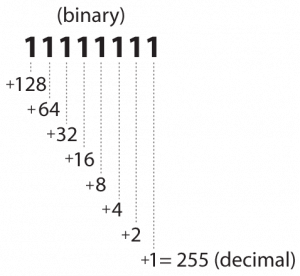 Looking at that really, really long string of 0s and 1s, you might think that binary is a really inefficient way to encode letters, numbers, and symbols. I mean, the single line of text, “Welcome to this week’s Math Munch!” turns into six lines of digits that make you dizzy to look at. But, suppose you were a computer. You wouldn’t be able to talk, listen, or write. But you would be made up of lots of little electric signals that can be either on or off. To communicate, you’d want to use the power of being able to turn signals on and off. So, the best way to communicate would be to use a code that associated patterns of on and off signals with important pieces of information– like letters, numbers, and other symbols. That’s how binary works to encode information. Computer scientists have developed a code called ASCII, which stands for American Standard Code for Information Interchange, that matches important symbols and typing communication commands (like tab and backspace) with numbers. To use in computing, those numbers are converted into binary. How do you do that? Well, as you probably already know, the numbers we regularly use are written using place-value in base 10. That means that each digit in a number has a different value based on its spot in the number, and the places get 10 times larger as you move to the left in the number. In binary, however, the places have different values. Instead of growing 10 times larger, each place in a binary number is twice as large as the one to its right. 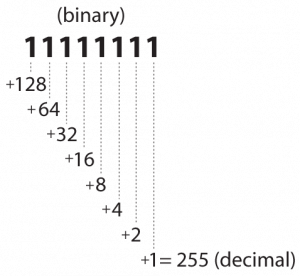 The only digits you can use in binary are 0 and 1– which correspond to turning a signal on or leaving it off. Speaking of videos, how about a math video contest? MATHCOUNTS is hosting a video contest for 6th-8th grade students. To participate, teams of four students and their teacher coach choose a problem from the MATHCOUNTS School Handbook and write a screenplay based on that problem. Then, make a video and post it to the contest website. The winning video is selected by a combination of students and adult judges– and each member of the winning team receives a college scholarship! Here’s last year’s first place video. i learned that no matter what, there is a room for each guest because infinity is never ending, so any amount of guests could stay. I have a question: What would happen if the hotel falls down because it is super tall? Haha, good question. I guess we have to assume that the hotel is also infinitely strong and structurally sound. Actually building such a hotel would be infinitely challenging, I’m sure. There are many scenarios of what might happen, such as an earthquake.. or a tornado. Also in the bottom levels, magma might burn the buildings, considering that the building may not be fire resistant. Also, I have a question…. Wouldn’t the fractionized rooms be fit for the smaller people/ children? I learned that infinity means that the rooms in the hotel will never run out. I learned that the rooms in the hotel are infinite and there is room for each guest, that means they will never run out of space for guests. If this is “the countable infinite”, would it still be considered infinite? Also, does the night manager ever get any sleep? I learned that there are an infinite number of rooms in the infinite hotel and there are also infinite negative numbers. This was a really interesting and funny post. I really enjoyed the video about the infinite room hotel and it just shows how crazy infinite is. I learned many things about infinite and the various equations the hotel manager could use if there was a problem with people getting a room. I learned a better way to understand the concept of infinity with the Infinite Hotel video. However, i didn’t understand the difference between countable infinity and infinity in general. What is the difference between the two? Hi, Eve! Your question about the difference between countably infinite and infinity in general is a great one. My favorite way to think of a set of numbers, rooms, or anything that’s countably infinity is that you can start putting the numbers/rooms/whatever in a row. You’ll never finish lining them up, because they’re infinite, but at least you can start and not miss any. You can’t do this, however, for any infinite set. For infinite sets that aren’t countable, you can’t even start listing– because as soon as you pick what goes first and try to pick what goes next, you’ll end up skipping something, and there’s nothing you can do about it. This is rather hard to picture… But I’ll try to find something good to post on Math Munch that will maybe make it clearer. Thanks again for the great question! This video was really cool! I had never heard of the concept of “countable infinity.” It makes sense- for example, you can keep counting by ones or twos or any whole number for as long as you want, and that sequence goes to infinity. But true infinity includes ALL the real numbers. There’s no way to include every decimal in existence; in fact, a decimal after one number can go on to infinity itself! So that means that there’s an infinity of infinities within infinity. That’s a baffling concept. The video didn’t mention anything about decimals, but I’d like to learn more about the infinities of non-repeating decimals (like pi). The Infinity Hotel video was interesting. I always thought of infinity as just a never ending number. I never thought about the fact that there would be negatives, and fractions, and numbers such as pi. As they said, it would become way too complicated once you move out of countable infinity, which is a concept I had also never thought of. This was an eye opening video to the expansive infinity. Hi, Olivia! Uncountable infinity really is a baffling idea. I find it particularly insane that there are uncountably infinite numbers that I’ve never even heard of– that aren’t solutions to normal equations, that don’t really serve us any purpose except to be numbers in that uncountably infinite set. Crazy! In this video, I learned the concept of infinity. Coding is a great example. And for the hotel every room was infinite, meaning there was room for every guest. On the “Infinite Hotel Paradox” video i learned the true concept of infinity. Putting this theory in the imagery of a hotel helped me out a lot. It made me understand more. On the Infinite Hotel Paradox video, I learned that I will never truly understand the concept of infinity, seeing as it is hard to wrap my brain around the fact that there are multiple levels of infinity. I had never though of there being different infinities, past only real numbers. It ties in with the concept of sequences and series we just covered/are covering in class, such as the idea of n+1. This was a very complex subject but the video was hilarious. I learned that there are an infinite number of prime numbers. Is there anything else the mathematician did? Is this how everyone in the world understood that numbers never end? If so, what was our view on numbers before? What was the “last” number? These are really great questions! I don’t know the answers to all of them, but here’s what I think… I think people always knew that numbers never ended, but they didn’t know how to prove it– meaning, they were pretty sure it was true but didn’t have a really convincing argument why. Also, I don’t think people always knew that counting numbers, even numbers, multiples of other numbers, etc., were all the same size of infinity. And I KNOW that people didn’t know that there were other sizes of infinity! If you want to learn more, I definitely recommend doing a little internet search. This is really interesting stuff! Wow the concept of infinity is quite hard to grasp what if they had an infinite number of beds in one room? that would sure solve some infinite families problems. and also can there be negative infinity ? can there be any number that ones mind could think up that would be so cool!!! I learned that infinity consists of fraction, decimals, irrational and negative numbers. I always thought of infinity as a never ending number. I think video makes everyone realize that there are more ways to get an infinite numbers then we realized. I learned that infinity consists of fractions, decimals, and negative numbers. There is also a room for everybody, no matter how many people come to the hotel. I would like to check into a room at the infinite hotel and experience what happens when the elevator takes 32 hours to get from bottom floor to my floor, even though I only booked for 24 hours.